Welcome to part 2 of our SEO Guide for Real Estate Investors, where you will learn everything you need to know about SEO. Last week we talked about how to determine the right keywords for real estate investors, what they are, and how to use them for your real estate investor website. This week we will be talking about user interactions with inbound and outbound links. Let’s go! Edutech Wiki defines “user interaction” as: “how the user acts on a system, and how the system acts on the user.” More simply put, user interaction is the elements of a webpage that someone visiting the website can take action on. For example, user interaction is anything from a button, to entering their email, to a link that a viewer can click on. In this blog post alone, you’ve already come across two forms of user interaction: the inbound link to our last blog post, and the outbound link to Edutech Wiki. User interaction will help your website’s SEO by letting Google know how relevant and helpful your site is. If lots of people show interest in your site, then you are likely to rank higher. An easy way to boost your website’s CTR is by including outbound and inbound links. This is important because it helps Google find credibility with what you’re saying and what other, already established posters, are saying. For instance, the links we provided to Google and to Moz Blog will help to boost this page’s credibility because those are respected sources. Because we’ve linked to preexisting posts, Google will find our post informative and useful to viewers such as yourself. This will boost this page’s CTR by showing our website higher in the search results and therefore getting more clicks, which will ultimately help our ranking. These meta tags are super easy to set and change using LeadPropeller. Type in your page title and description! Google describes bounce rate as “sessions in which a person left your site from the entrance page without interacting with the page.” Or, more simply put, the percentage of a viewers who leave your website without interacting with any other pages. You want a low bounce rate for your website, because a high bounce rate means that a viewer did not find your site relevant enough for their search. High bounce rates can be caused by a number of things, all of which you want to avoid in order to help your SEO and CTR. If your bounce rate is too high, Google will think that your website is not useful enough in searches. This will cause your website to rank poorly. To improve your site’s bounce rate, you should fix any issues mentioned in our graphic. Additionally, Google suggests using content experiments to check your bounce rate. Pages per visit is simply how many pages on your website a viewer goes to during one session. Not only will this help your CTR, because a viewer is traveling from one page on your site to another, but it will also help to improve your site’s bounce rate that we just talked about. To improve your pages per visit, be sure you’re using internal links (which we’ll talk about further down). That way, a visitor to your site will be compelled to go further into your content. Your pages per visit should never be one because that means that users aren’t interacting with your site. If there are people not interacting with your site immediately, it’s probably because they did not find the information they searched for. If this happens, then you need to include clear avenues through your site that will direct them to a page that will answer their search question. Your website should be engaging enough for your target audience to interact with, not click away from. For example, in this blog the very first link we attached was a link to Part 1 of our SEO Guide. This helps redirect traffic around our site. This is a great way to inter link because someone who found this page might not have known about Part 1 without that link there. Similarly, Part 1 of our SEO Guide has internal links to our other blogs. This creates a web that links our content and improves traffic through our site. While internal links don’t necessarily add that much in ranking, they do help direct viewers of your website to more of your content. Getting eyes on your content will help to build your site’s credibility online. The rule of links being relevant still applies to internal links. 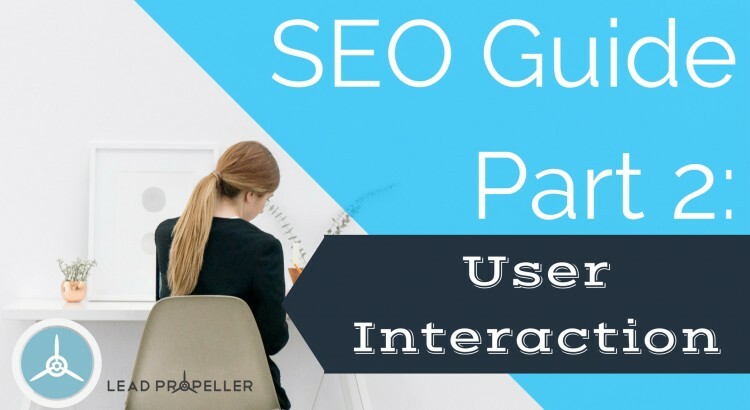 We linked to Part 1 of our SEO Guide because that made sense as an internal link in this blog. We wouldn’t link to an article about cats for two reasons: 1 – Cats have nothing to do with our content, and 2 – Cats have nothing to do with SEO, and would just weaken our page’s credibility. Like we’ve already stated, linking to respected sources will help your website’s SEO and click through rates. Always keep in this in mind: The more you link to other relevant sources, the more useful your site will be. So, should you be using outbound links in your website’s posts? Absolutely. As long as they’re relevant. Take this blog post for example again. At this point, we’ve already externally linked to Edutech Wiki, Google, Moz Blog, and Reboot. Those links are all relevant to the material we are covering, but more importantly, those links are authoritative and informational. The difference in having an outbound link that’s authoritative, or high-value, and an outbound link that is low value is how established that site is. Reboot was a high-value outbound link to add in this blog because it presented information that is both relevant and helpful to our post, and to our audience (you). You might be thinking “won’t outbound links direct traffic away from my website?” Well, not really. By using useful outbound links in your posts, your website is demonstrating to Google that you are up to date with current information, and are providing useful sources for your viewers. This will ultimately help your traffic flow because Google will start to rank you higher the more relevant your posts are. Where do you get these links? Which sites have high value? You’re a real estate investor. You shouldn’t be asking these questions, you should be closing deals. Use LeadPropeller’s extensive system of outbound links without lifting a finger. Our done-for-you SEO services for real estate investors provides content with high-value outbound links built right in! The main point of an inbound link is to link to another web page that also links back to something on your website. Basically, an inbound links definitely help with ranking higher in searches because they tell Google that other people are talking about you. But remember, just like outbound links, your inbound links need to be relevant. Something like an article that a third-party wrote about you, or a promotional page from another established site. Links like the ones mentioned above will help build your online credibility. Google looks at to determine ranking and relevancy to a search. Your website is your real estate investor business’s storefront, the more credible you are the more likely you are to get visiting customers. In this part of our SEO Guide series, we’ve talked about CTR, metatags, bounce rates, pages per visit, internal links, outbound links, and inbound links. By having all of those aspects as part of your website, your time on page will go up. Let’s think of your website like a storefront again. You want potential customers to spend time in your shop, just like you want them to spend time on your website. The Weidert Group, a B2B Inbound Marketing Agency, defines time on page as “the average of the amount of time visitors spend on a page”. Basically, time on page is simply how long someone stays on your page. Pretty straight-forward, right? Using Google Analytics, you can keep track of, and measure, the average of how long a session lasts on your website. That way you will be able to see the way this SEO Guide has helped you to make your website stronger in searches! Don’t Have Time For SEO? SEO is important, but certainly is not the only important part of getting your real estate investor website more traffic. If you’re just starting out with a website, having a good take-off strategy will give you a strong foundation to build a long-term strategy off of. But managing all of this can be very time consuming for a real estate investor. After all, you’re here to do real estate investing, not babysit a website. That’s where LeadPropeller’s SEO services can save you time so you can get back to the fun part: finding leads and making deals. At LeadPropeller, we take our years of experience to better manage your website’s SEO. While it is good for you to have an SEO Guide, with LeadPropeller’s SEO service we take care of all of this so you don’t have to! We’ll deal with the SEO so you can deal with, well, deals. What could be better?